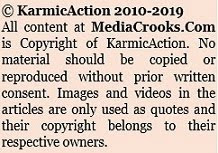 For over a year many readers had been requesting a compilation of posts on MediaCrooks (MC) be published in a book form. A compilation of over 400 posts would be quite bulky so I have chosen the 50 most popular posts that cover many media related issues that would remain relevant over time. The book ‘Social Media As Watchdog’ (SMW) brings you that compilation. Going beyond a mere compilation the book explains the arrival of Social Media as a watchdog over MSM and how there is no monopoly on national discourse anymore. The book compiles the posts in 9 freshly written chapters. Recent events have shown that the SM is starting to influence discussions and debates on TV, newspapers and news sites. This is one of the most heartening developments in our country. SM puts power back where it belongs: in the hands of ordinary people. Those who pooh-poohed the internet, blogs, Facebook or Twitter will not be able to ignore these anymore. Those who adapted to these new communication tools will benefit from it. In a few years one can expect the SM to become the more dominant voice in public discourse. The MSM does not have the monopoly on dictating the national discourse anymore. Even those in the profession of journalism or hoping to enter the profession can use the book for some introspection. I am frequently asked the question if MC has made any difference to the MSM. It is hard to tell and even harder to measure. One thing I can confirm is that most MSM people do read the blog frequently. The greater purpose was to ensure that readers become more aware of the spins, distortions and deceptions by the MSM. That purpose is being served well and many consumers of news and debates are now carefully assessing each word and sentence being uttered in the media. On the SM, anyone who can reasonably construct a response in 140 characters can claim a response to the MSM. The other important task MC had undertaken was to respond to MSM not with mere opinions but with cold, hard facts. I have consistently believed that facts count and opinions belong in the garbage can where public discourse is concerned. Opinion matters the most when it goes into the ballot box. In most corporate bodies people with facts are more useful in decision making than those with opinions. In business, though, decision-making by an educated guess, gut-feeling or instinct is always welcome but these should not be welcome in news reporting and analysis. SMW shows how willful deceptions by the MSM are being challenged and rectified by Social Media. The collection also shares a limited list of a dozen books and movies that form a background to the posts on MC. These books and movies have been often used to create analogies to explain the behaviour and news-delivery of MSM. Also included in the book is list of a dozen other great blogs and websites which best analyse and offer commentary on the MSM and current affairs. There are many others that I follow but had to limit these lists to a dozen. 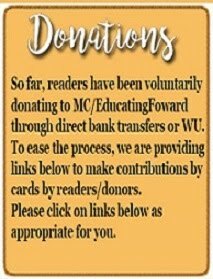 One thing that does bring joy to me is that many readers of MC have now started their own blog and are writing their responses and analysis of news and current affairs. Writing is a joy but to make it impactful it needs some tactics. In the book I share five unique writing and branding tactics employed at MC for the benefit of readers and budding writers. Thanks to Prof. R. Vaidyanathan of IIM Bangalore who has written the foreword for the book. He is a finance & economy expert and a keen observer of media himself. Those wishing to procure a copy of the book may CLICK HERE and get details of the book and the ordering process. Firsly let me congratulate MC on this noble venture.It would make the task of all parents teachers, that much easier, to spread awareness among their wards about the misinformation all around in the name of news.I will for sure present this book to my children and I am sure it would arouse one's conscience more than anything else in the world.The rest of the job is easy to build up a new generation free from propaganda driven world. Congrates Ravinar ji for this eagerly awaited book. You have opened the eyes of many people, and I hope that this number will keep on increasing exponentially as the internet spreads wide and deep. Your contribution to the national awakening is enormous, and I am looking forward to read the book eagerly. Congratulations once again. Ravinar jee, I hope u have clearly defined what is MSM in Indian perspective, what all it includes and what all it does not, and how to dig information on SM for news. Congratulations! I wish, the book gets great response! It would have been great, if it were available to be ordered in US right away. But I hope, it will be soon. Congratulations and wishing this becomes a movement, so that many more keen-eyed tweeples & bloggers continue scrutinizing the MSM and their agenda many years into the future! In the absence of an official and NONPARTISAN watchdog for the TV media, such exemplary initiatives remain the only hope for the common public to discern facts from fallacies, news from propaganda and truth from canards. Well, I will definitely be asking my friends & family to buy a copy soon. Congrats Shri Ravinar, India will be ever thankful to you for your selfless service to the motherland. When most people are embedded in materialistic life running after money 50 hours a day you spent so much invaluable time energy and knowledge in exposing the Traitors/Sycophants/DynastyBootLicking #PaidPervertedPress. More so what makes me happy is what you have observed that many are following your foot steps-" One thing that does bring joy to me is that many readers of MC have now started their own blog and are writing their responses and analysis of news and current affairs. Writing is a joy but to make it impactful it needs some tactics"
Also thanks for sharing your knowledge-"In the book I share five unique writing and branding tactics employed at MC for the benefit of readers and budding writers"
Also i conclude that one has to be a GENIUS to write like you Shri Ravinar. Congrats Sir !!. The most awaited book. Hope a series follows. Ravinar jee, u did not mention in bank AC details that is it a saving or current account i.e. type of account. Pls update it with this info. Being a publishing firm .. Its a CURRENT account.. Thanks!..Order placed..first good buy of Navraatri season!! Happy Ugadi to you Ravinar! May God strengthen your noble hands for bigger and better things to come! This is a terrific venture that will streamline your gems of articles to even wider audience that may not have read them till date. Second this.. would help if we got a confirmation mail or something... btw, Great initiative Ravi. Happy Ugadi. Congratulations Ravinar... will it be available overseas as well? Dubai does have a HUGE Indian population! Sure.. I'm just having the first print lot given to readers in India. The second lot will also cater to readers abroad. I am also planning to get atleast 10 copies here in Dubai so I can distribute freely to all friends here. @Utpal..with active social media citizenship comes active social responsibility...nice gesture. I have decided to keep it on my office desk. 3. send email to ur yahoo groups/alumni..about this new arrival. Congrats Ravi ! and wish many more books to come . all the best for future .take care and god bless . This is really a great happening. Congrates Ravi for your efforts. Thanks and Congratulations Ravinar ji . Ever since I read the book Eminent Indian Historians , I was expecting someone to write on Eminent Indian Journalists . God bless you and take care . Please make the book available on kindle or Google play. Your followers abroad like us will be able to access it. I wish SMW will "awaken" many more Indians to the fact that we need to put in our conscious effort to correctly understand the happenings, and I congratulate you on bringing out this book. As with many others, it has now become a daily routine for me to visit MC and look out for what you have written. Great initiative and happy Ugadi! I will definitely get my copy. May the Vijaya Nama Samvatsara strengthen your resolve and our fight against each and every thread of anti-Indian DNA in our great country! It's great initiative .. I wish good luck for you.. I daily read updates from your twitter page and blogs. bravo.. I just thought book should be available in 100Rs price tag..so that people can gift that as many as they can to friends to spread good cause. You can give separate a/c number where ppl from abroad/India/(parties opposing Congress who buy media) can donate some money to recover price.Once book is best seller you can get same benefits as mass volume sell give same returns. I appreciate its not social service but just put thought. One more request when it will be available on flipcart? Hello Ravi, I guess you can also publish all your articles year-wise. I don't think you are doing justice to the readers by just publishing only 50. You are too good man and every article is a killer. is there a delivery mechanism for people outside India ? Will this book be available in book stores and online stores like Flipkart? Also have you considered publishing an e-book version on Amazon or Google play store? It is not unusual for people working in public health, for example in tobacco control, to own one share in big tobacco companies. This permits them to attend AGMs, ask for research papers as well as ask if a cigarette contain toilet cleaning products, insect repellants, acetone, for example, in the presence of thousands. They declare their one share as a conflict of interest because they believe they have to engage with the hazard merchants in their home turf. Clearing space for pubic health requires serious and systematic work. Journalism, like public health, is a public good. The public has a right to know who owns what as do reporters. Mediacrooks has done several things, but above all, Ravinar is leading from the front clearing space for news, views, comments etc in a transparent way. Agree or disagree, no one can deny that he has changed the way people consume news. I'll go a step further - he has changed the rules of the game by brining everything back to basics and empowered allof us by maing us share-holders. Congratulations and more power to you. Kudos and Congratulations for bringing out the book. However, I am sorry to say, but the book is over-priced. I had hoped of buying 5-6 copies so that I could gift it to friends and family. Quoting you, "The greater purpose was to ensure that readers become more aware of the spins, distortions and deceptions by the MSM." Well, an affordable price would have surely helped in achieving the above purpose. I don't know what factors led to such high pricing. A clarification from your end would be appreciated. Thanks for the book . I have received it a couple of days back. I am very happy that I was able to influence few of my friends in reading your blogs to make them aware of media and their lies. Ok let , me comeback to some of the suggestions for the book . Pros : From technical-aspects , it is the contents of the book for which I bought it and I believe others also would have done for the same . However I think there are some non-technical aspects of book that can be improved .